In what looks like a mockery to the fight against corruption in Africa, President Muhammadu Buhari is being applauded by leaders who watched him making elaborate speech at the African Union Summit. 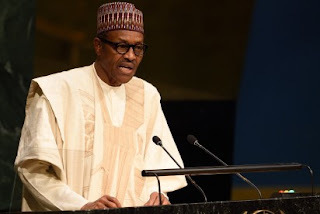 While the fight against corruption in Nigeria has been largely lost and the government of oppression took the lead, President Buhari took the mockery title of Being the Champion of the theme of the 30th AU Summit, namely, “Winning the Fight against Corruption: A Sustainable Path to Africa’s Transformation,” President Buhari thanked his African colleagues for entrusting him with such a noble responsibility. The President, who noted that Africa has made some significant strides in enacting legal and policy frameworks such as the African Union Convention on Preventing and Combating Corruption (AUCPCC) to address the vice, said the desired impact had been lacking. “Fifteen (15) years after the adoption of the African Union Convention, 2018 provides a good starting point to take stock of progress made so far, assess what still needs to be done and devise new strategies to address new corruption challenges,” he said. As the president of corruption, to show that he knows the truth but decided to be hypocritical in his approach, he identified other negative effects of corruption as, posing a real threat to national security; eroding the development of a universal culture of good governance, democratic values, gender equality, human rights, justice and the rule of law. In tackling bribery and corruption, the Buhari said the crucial place of strong institutions cannot be over-emphasised. “A Judiciary which stands firm against arbitrariness and injustice by the executive is a vital pillar in the anti-corruption fight. As leaders, we must build synergy between the Executive, Legislative and Judicial arms of government in order to entrench good governance, transparency and accountability. “Strong institutions are a necessary condition in any society which aims to fight corruption. In building strong national and regional institutions, we must adequately empower our national anti-corruption agencies and insulate them from political influence.